RAWALPINDI, Nov 7 (APP): The troops of Pakistan Army conducted night field manoeuvre exercise to validate operational plans besides enhancing preparedness. 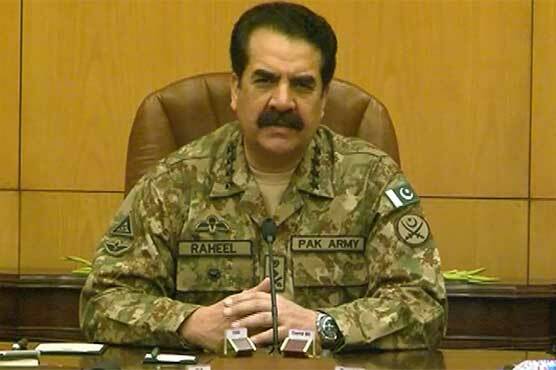 Chief of Army Staff (COAS) General Raheel Sharif visited exercise area around Kharian-Gujranwala and witnessed troops engaged in the ongoing Army Field Exercise, Inter Services Public Relations (ISPR) stated in a press release here on Monday. The COAS was briefed in detail about objectives and conduct of the Exercise from newly inducted hi-tech net enabled virtual war room. He later also witnessed field manoeuvre at night. Army field exercise is being conducted in Central and Southern Command to validate operational plans and enhance own preparedness. Infantry and Mechanized columns of the central command with their requisite supporting troops and Punjab Rangers are carrying out the exercise. He appreciated an excellent standard of training, professional skills and high morale of the participating troops. Commander Central Command, Lt Gen Umar Durrani, Commander Gujranwala Corps Lt Gen Ikram Ul Haq and Inspector General Training and Evaluation (IGTE) Lt Gen Qamar Bajwa were also present.